The groom had a rather Ichabod Crane vibe, wearing a Victorian frock coat and brocade vest, and a shirt with lace cuffs and lace ascot. The vest was black brocade with silver buttons. The trousers were black, with a placket-type fly with silver buttons. The coat was a black silky fabric lined with scarlet. The shirt was a lightweight satiny fabric, with lace edging. Source The coat, vest, and trousers were a pattern obtained from Richard the Thread. Although I eventually triumphed over this pattern, I wasn't terribly pleased with it. It was expensive, and the pattern itself was not clearly marked. I had a lot of trouble matching pattern pieces. Source Detailing on the coat included glass buttons with an embossed spider design. Source The shirt was a Simplicity "Begotten" pattern (#8615). I used the version with the ascot. 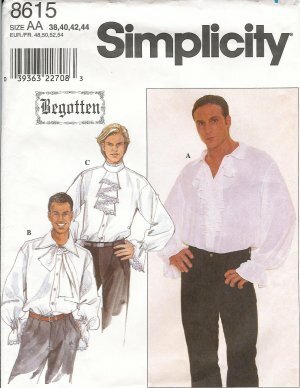 A Romantic style is particularly nice for the groom, giving him a chance to unleash his inner Heathcliff. Think loose shirts with lacings, ascots and jabots, and tall boots. If you're set on a tuxedo, consider a retro-look tux, or even a Dracula-type formal evening cape. For a slightly-goth-but-still-formal look, the groom will probably have an easier time than the bride. Black morning coats and tail coats are plentiful (undertakers traditionally wore swallowtail coats), and you may even be able to find a rental shop which offers frock coats. Look for patterned silk waistcoats, and perhaps a top hat. If you're going for a harvest theme, look for jewel-tone or autumn-colored accessories like bow ties and cummerbunds. Medieval and Renaissance attire, and (for some reason) kilts are all popular choices for Halloween grooms. Check out the Links section for sites that cover these themes.